Athene Noctuna [C5648] - $8.00 : Yarn Tree, Your wholesale source for cross stitch supplies. Cross stitch pattern by Ink Circles. 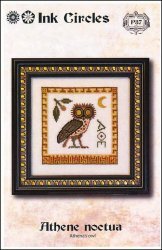 The little owl, Athene noctua, is the traditional representation of Athena, the goddess of wisdom in Greek mythology. This design reflects the imprint on the ancient silver tetradrachm coin that was used in Athens and all of the Greek empire around 450 BC. One side shows Athena and the other, the owl with an olive branch. The letters AOE stand for Athena. Isn't he just a "hoot!" Stitch count is 81w x 81h.